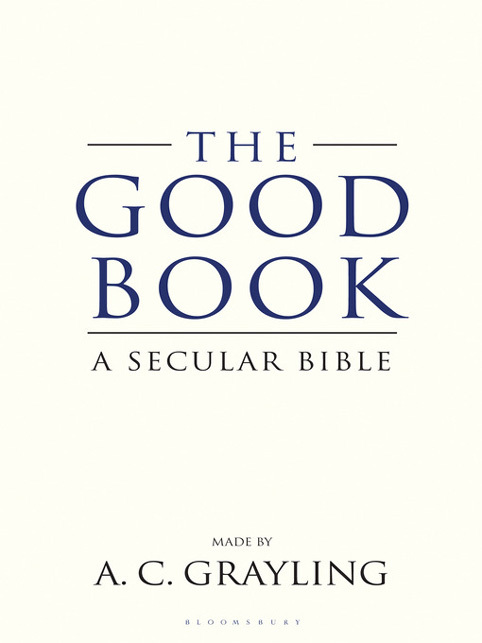 Subtitled A Secular Bible this hefty tome sets out to do exactly what it says on the tin. In his Epistle to the Reader, AC Grayling, professor of philosophy at London University, sums up his work as “…a text made from all times for all times, its aspiration and aim the good for humanity and the good of the world.” A modest undertaking, then. But Grayling’s monumental prospectus, which could, in less able and sensitive hands, have been merely overweening, if not actually hubristic, is realised in large part, if not in full. The first thing that strikes one about this book (apart from its impressively biblical dimensions) is its layout. With named Books, chapters and verses (numbered, of course) set out in two columns per page – and there are an awful lot of pages (597 to be precise) – this undoubtedly induces a comforting sense of familiarity in those who have been brought up with Holy Books. Even if no longer believing in their contents it makes embarking upon the task of reading less daunting than it might otherwise have been. Despite the element of pastiche inherent in this stylistic decision (and it is certainly not essential to the work’s overall success) the format worked for me. While it might not have done much to enhance my appreciation, neither did it diminish it. I must confess that, considering I was reading a self-proclaimed Good Book (which I approached with all due reverence and seriousness of purpose) frivolous thoughts nevertheless surfaced unbidden from time-to-time. Why was it that youthful memories of Richard Bach’s early-‘70s cult classic novella, Jonathan Livingston Seagull, came to mind? And, from the same era, those ubiquitous posters and teatowels featuring the Desiderata, allegedly “found in Old St Paul’s Church, Baltimore, AD 1692” – “Go placidly amid the noise and haste…” etc? Perhaps I was distracted by the temptation to patronise all such efforts as pop- or worse, cod-philosophy. But just as the fact that the Desiderata was actually written by Max Ehrmann in the 1920s does not make its sentiments bogus, neither does the high-minded and poetical (if not lyrical) tone Grayling adopts in his very contemporary work strike one as inappropriate to the task in hand. On the contrary it reads, on the whole, very well and, despite its archaisms (unavoidable in such an enterprise, one imagines) is neither stilted nor overblown. I am also old enough to remember Hermann Hesse’s 1920s novellas, Siddhartha and Steppenwolf, being read as counter-cultural classics in the late ‘60s and, whilst I suspect Grayling might find this comparison less odious than the former two, none of them is intended sneeringly. Grayling’s sincerity shines through as strongly as his erudition and any quibbles or misgivings one may have at the outset are dispelled by the sheer chutzpah of his sweeping ambition – even where one might not be entirely convinced that his chosen style successfully welds together into a homogeneous whole the thousand or so texts from which the work is apparently derived. But, then, the one factor that enables the Christian Bible so successfully to blend its disparate parts into an ostensibly seamless whole in the English-speaking world is undoubtedly the transcendent beauty of the early-17th century English of the King James Version – and who could ever hope to equal, let alone rival that? For example, as I read the Book of Wisdom (the second of fourteen Books into which the work is divided), I could not help but think that it will very likely find its greatest and most enduring success as a secular alternative to the Bible for readings at non-religious ceremonies such as register office weddings, civil partnerships, humanist funerals, naming ceremonies and other rites of passage over which the monopoly of established religions has lost its grip, leaving non-believers, until now at least, at something of a loss. In fact, I found myself somewhat distracted in my reading by the thought that I ought to mark various passages as I came across them in preparation for precisely such an eventuality! After all, in matters of life and death, it pays to be prepared and in The Good Book Prof Grayling has done all the hard work for us.